The production and use of addictive stimulants has been a major problem in South Africa. Although research has shown increased demand for drug abuse treatment, the actual size of the drug-abusing population remains unknown. Thus the prevalence of drug abuse requires estimation through available tools. Many questions remain unanswered with regard to interventions, new cases of substance abuse and relapse in recovering persons. A six-state compartmental model including a core and non-core group, with fast and slow progression to addiction, was formulated with the aim of qualitatively investigating the dynamics of substance abuse and predicting drug abuse trends. The analysis of the model was presented in terms of the substance abuse epidemic threshold R0. Numerical simulations were performed to fit the model to available data for methamphetamine use in the Western Cape and to determine the role played by some key parameters. The model was also fitted to data on methamphetamine users who enter rehabilitation using the least squares curve fitting method. It was shown that the model exhibits a backward bifurcation where a stable drug-free equilibrium coexists with a stable drug-persistent equilibrium for a certain defined range of values of R0. 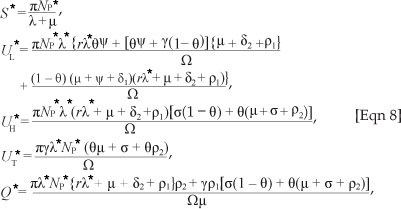 The stabilities of the model equilibria were ascertained and persistence conditions established. It was found that it is not sufficient to reduce R0 below unit to control the substance abuse epidemic. The reproduction number should be brought below a determined threshold, R0c. The results also suggested that the substance abuse epidemic can be reduced by intervention programmes targeted at light drug users and by increasing the uptake rate into treatment for those addicted. Projected trends showed a steady decline in the prevalence of methamphetamine abuse until 2015. Substance abuse remains a major global health and social problem.1 The production and abuse of addictive stimulants has increased dramatically in South Africa in the last decade and, in particular, there has been an increase in demand for treatment services for first-time admissions in recent years.2 Not only has this increase impacted on costs to the public health system, but other epidemics, such as HIV, have also increased significantly. For example, in the 2005 antenatal survey, the Western Cape Province of South Africa had the highest increase of new HIV infections, from 13.1% in 2003 to 15.7% in 2005, compared to other provinces.3 Therefore, the development of comprehensive, effective and sustainable strategies for the prevention and management of substance abuse requires a multisectoral approach, which should involve health-care professionals, policymakers, psychiatrists and researchers. The array of possible interventions includes primary prevention (to ensure that substance abuse does not develop), secondary intervention (involving early identification and effective treatment in order to prevent escalation) and tertiary intervention (to reduce substance-related harm). In South Africa, data is collected on admission for treatment for drug abuse every 6 months as a regular monitoring system for drug use trends. Treatment or rehabilitation services for substance abuse problems have not kept pace with the increase in demand for treatment and the treatment programmes do not operate on evidence-based treatment models.4 It is thus important to monitor drug use patterns and predict trends over time. The similarities between the spread of substance abuse and infectious diseases has been pointed out by a number of researchers.7,8,9,10,11,12,13,14,15 Substance abuse is obviously not communicated as an organic agent but as a kind of socially acceptable innovative practice by those on drugs to those who are susceptible through interactions. The epidemiological concepts of incidence' prevalence and the reproduction number become valuable in studying substance abuse.13'15 Recent models on drug abuse include the work of Mulone and Straughan8, White and Comiskey13, Burattini et al.14, Nyabadza and Hove-Musekwa15. 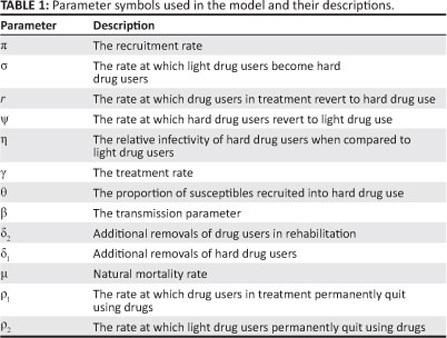 In these models, the rate of generation of new initiates was dependent on contact between non-drug users and drug users. In this article' unlike in the cited work' the total population was divided into two groups: the core group NC and the non-core group Np. The core group comprises individuals who are at risk of becoming drug users and cause others to become drug users (they can also be referred to as the active group). The non-core group is the non-active subgroup of the population which acts as a source of individuals to the core group. The idea of core and non-core groups has been used in the modelling of sexually transmitted infections (for example see Hadeler and Castillo-Chavez16 and the references cited therein). The categorisation of individuals into core and non-core groups helps in disease control and management strategies. We extended the compartmental model presented by Nyabadza and Hove-Musekwa15' which provided a structure in which numbers of individuals in each compartment can be tracked in time as relationships between compartments' described in mathematical terms, evolve. Our aim was to qualitatively study the dynamics of a substance abuse epidemic in a scenario where the population is subdivided into a core group NC and a non-core group Np in the presence of treatment. We also aimed to show the usefulness of the model in predicting the prevalence of methamphetamine abuse, which is difficult to determine using ordinary data collection methods. We focused on stimulants such as methamphetamine as the substance of abuse. Unlike in Nyabadza and Hove-Musekwa15' we allowed for slow and fast progression of potential substance users to addiction and a cycle of light and hard drug use. 'Light drug users' refers to individuals who are in their initial phase of drug use' whereas 'hard drug users' represent individuals who would have reached a phase of problematic drug use' usually characterised by addiction. We also included permanent quitters or individuals in remission' to allow for those individuals who permanently stop using drugs' as well as reversion or relapse' which is synonymous to re-infection in the model by Nyabadza and Hove-Musekwa15. Relapse was considered only for those who were under treatment; this consideration was necessitated by the fact that the treatment does not involve isolation and individuals remain in the community during the treatment programme. We diagrammatically represent the flow of individuals from one class to another in Figure 1.
θ of susceptibles upon recruitment into drug use, when light drug users become hard drug users at a rate s and when drug users in treatment revert to hard drug use at a rate r. The population of hard drug users is decreased by removals that are related to hard drug use at a rate d1 and when hard drug users enter treatment at a rate g. The removal rate d1 models deaths and removals of individuals (e.g. as a result of imprisonment) that are drug related. Drug users in treatment are generated by hard drug users who start treatment at a rate g. This population is decreased by removals at a rate d2, when those in treatment become hard drug users at a rate r and when they permanently quit using drugs at a rate P1. The population of permanent quitters is increased when light drug users permanently quit using drugs at a rate P2, as well as when drug users in treatment quit using drugs permanently at a rate P1. We assumed that individuals in each class die naturally at a rate μ. The definition of each parameter is given in Table 1. S(0) ≥ 0, Ul(0) ≥ 0, Uh(0) ≥ 0, Ut(0) ≥ 0, Q(0) ≥ 0.
with initial conditions S(0) ≥ 0, Ul(0) ≥ 0, UH(0) ≥ 0, Ut(0) ≥ 0, Q(0) ≥ 0, is positively invariant and attracting with respect to [System 1] for all t > 0. This means that is the upper bound of NC. On the other hand, if then NC(t) will decrease as . This means that if then the solution (S(t), UL(t), UH(t), UT(t), Q(t)) enters G or approaches it asymptotically. Hence, G is positively invariant under the flow induced by [System 1]. Thus in G, [System 1] is well-posed mathematically. 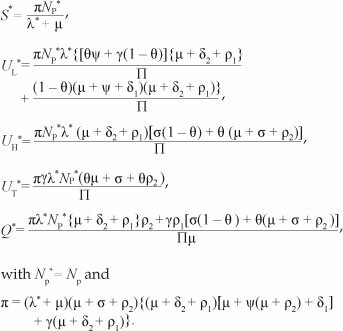 Hence, it is sufficient to study the dynamics of the model in G.
For [System 1], it is important to prove that all the state variables remain non-negative so that the solutions of [System 1] with positive initial conditions will remain positive for all t > 0. We thus give Lemma 2. S(t), Uiit), Uh(í), UT(t) and Q(t) are non-negative for all t > 0. Uh(I) > 0, U(t) > 0 and Q(t) > 0 for all t > 0.
where . R0 in this case represents the average number of secondary cases that one drug user can generate during his or her duration of drug use in a population of potential drug users. The expression of R0 is the sum of two terms representing the contribution of light drug users and hard drug users. Hence, using Theorem 2 of van den Driessche and Watmough17, we establish Theorem 1. The drug-free equilibrium point, E0 , is locally asymptotically stable if R0 < 1 , and unstable if R0 < 1 . We now illustrate the above theorem numerically. 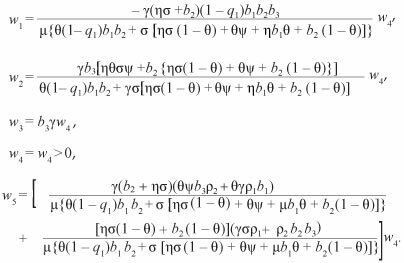 We performed numerical simulations using a fourth-order Runge-Kutta scheme in Matlab.18 The aim was to verify the analytical results obtained on the stability of [System 1]. We first established the parameter values to be used in the simulations. For the purpose of these simulations, we considered hypothetical populations of one million individuals for the core group and four million individuals for the non-core group. 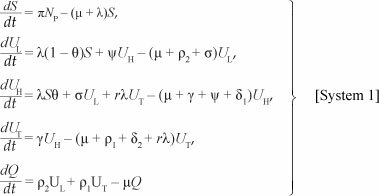 We arbitrarily set the initial conditions for the system for illustrative purposes. We considered the case when R0 < 1 , in particular when R0 = 0.6541. 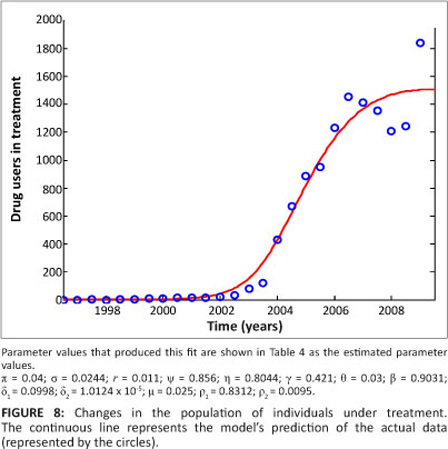 For varying initial conditions when R0 = 0.6541, the dynamics of drug users is represented by Figure 2. These results show that the population of drug users declines to zero, that is, it approaches the drug-free equilibrium. The results also show that the drug-free equilibrium is locally asymptotically stable whenever R0 < 1 . These results support Theorem 1 on the stability of a drug-free equilibrium. We thus produce Theorem 2 on the existence of the drug-persistent equilibrium. 4. no drug-persistent equilibrium otherwise. R0 < 1 is, although necessary, no longer sufficient to end the substance abuse epidemic. Theorem 2 can be illustrated in the bifurcation diagram shown as Figure 3. Figure 3 is reminiscent of a standard backward bifurcation diagram (see for instance Dushoff25). We emphasise here that the parameter values chosen are for illustrative purposes only and may not necessarily reflect a real substance abuse phenomenon. The simulation results depicted in Figure 3 show that [System 1] only has the drug-free equilibrium when R0 < R0c < 1 , two drug-persistent equilibria when R0 < R0c < 1 and one drug-persistent equilibrium when R0 > 1 , as shown by Regions A, B and C, respectively. 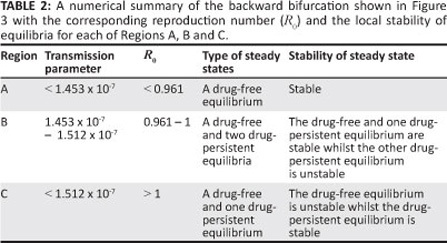 In Region A, the drug-free equilibrium is locally asymptotically stable, whilst in Region B one of the drug-persistent equilibria is stable and the other is unstable. This result clearly shows the coexistence of two stable equilibria when R0 < R0c < 1 , confirming that [System 1] exhibits backward bifurcation. In Region C, the drug-persistent equilibrium is stable. The results shown in Figure 3 are summarised in Table 2. The simulations were in agreement with Theorem 2. The time series plots shown in Figure 4, for different initial conditions, also reflect the existence of multiple steady states. 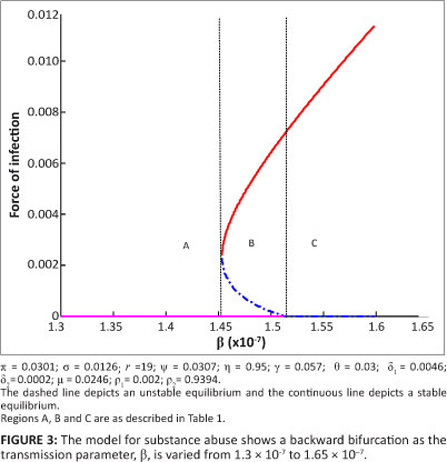 The parameter values are as given for Figure 3 with b values being within each of Regions A' B and C. It can be seen that, irrespective of the initial conditions' the force of infection stabilises to a drug-free equilibrium in Region A' one drug-persistent equilibrium and one drug-free equilibrium in Region B and to a drug-persistent equilibrium in Region C. Lemma 3 is thus established. [System 1] undergoes backward bifurcation when Case 3 of Theorem 2 holds and R0C < R0 < 1. Hence, in this case (with r = 0), no drug-persistent equilibrium exists whenever R0 < 1. It follows that, owing to the absence of multiple drug-persistent equilibria for [System 1] with r = 0 and R0 < 1, a backward bifurcation is unlikely for [System 1] with r = 0 and R0 < 1. 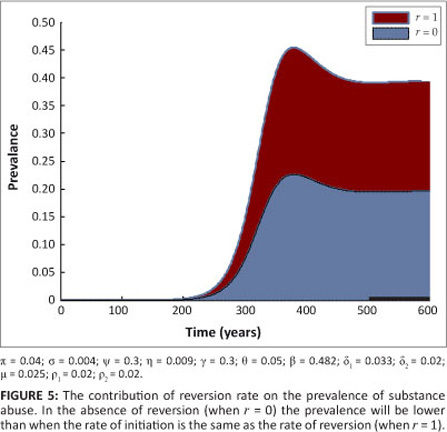 Figure 5 shows the contribution of the relapse rate r on the prevalence of drug use. In the presence of relapse, the prevalence of drug use is higher. It is important to note that when r = 0, the ability of drug users not in treatment to recruit initiates from the susceptible population is the same as the ability to recruit from individuals in treatment. The absence of multiple drug-persistent equilibria when r = 0, suggests that the drug-free equilibrium of [System 1] is globally asymptotically stable when R0 < 1. We thus produce Theorem 3. Consider [System 2] with r = 0. The drug-free equilibrium is globally asymptotically stable in G whenever R0 < 1. Because after substituting a1 and a2 in [Eqn 11], we obtain . Furthermore V(t) = 0 when R0 = 1, that is, when UL = UH = UT = Q = 0. 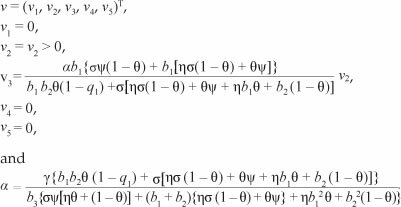 By LaSalle's invariance principle, the largest invariant set in G, contained in is reduced to the drug-free equilibrium. This pro ves the global asymptotic stability of E0 in G (see Bhatia and Szegõ26, Theorem 3.7.11, page 346). Hence the sign of a depends on the value of r and X, such that if Γ > X then a > 0 and if Γ < X then a < 0 whilst b > 0. We thus obtain Theorem 4. If Γ > X, then [System 1] has a backward bifurcation at R0 = 1 . Alternatively, if Γ < X, then [System 1] undergoes forward bifurcation and the drug-persistent equilibrium is locally asymptotically stable for R0 > 1 but close to one. Further, using the same initial conditions when R0 = 1.7443, the population of drug users tends to a drug-persistent equilibrium in Figure 6. This pattern indicates that, irrespective of the initial conditions, the population of drug users eventually settles at the drug-persistent equilibrium with increasing time. This result is in agreement with Theorem 4. It is also important to investigate how some key parameters jointly influence the epidemic. This investigation was performed using contour plots. In Figure 7, contours of R0 are plotted as a function of transition rates s and p2 in Figure 7a, p2 and y in Figure 7b, g and p2 in Figure 7c and g and y in Figure 7d. Based on the parameter values used in the simulation, Figure 7 shows that increasing s, p2 and g reduces the model reproduction number, whilst increasing y increases R0. This pattern indicates that R0 is a decreasing function of s, p2 and g, and is an increasing function of y. These results can also be obtained by performing a sensitivity analysis on R0. According to the model, to decrease the reproduction number, it is thus necessary to increase the rate at which individuals become hard drug users, the rate at which they permanently quit and the rate at which they are rehabilitated. This result makes sense as increasing forward progression rates eventually leads to more individuals quitting. The significance of increasing s to fight the epidemic is an outcome of the model formulation for two reasons. Firstly, hard drug users have been assumed to be less effective recruiters and secondly, the class of hard drug users is the entry point into treatment programmes. It is thus advantageous according to the model, for identification purposes, that an individual remains a light drug user for only a short time. In reality, this result remains debatable. We applied the model to data on methamphetamine abuse in the Western Cape. [System 1] was fitted to the data for individuals who attended specialist treatment centres in the Western Cape. This data is collected every 6 months by the South Africa Community Epidemiology Network on Drug Use2 for individuals who attend specialist treatment centres in the Western Cape. The data on treatment demand trends was used to model the growth of individuals in the UT class in our model. 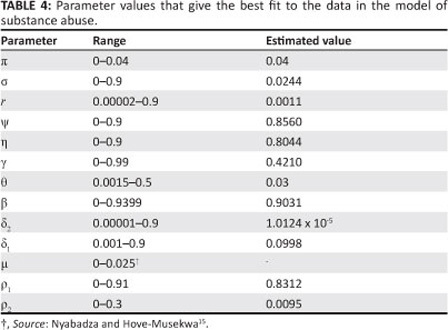 The data for the growth of methamphetamine users in the Western Cape is given in Table 3. Table 3 includes all individuals who use methamphetamine as their primary and secondary substance of abuse. Many parameters are known to lie within limits. Only a few parameters are known exactly and it is thus important to estimate the others. The estimation process attempts to find the best accordance between the computed and observed data. The estimation can be carried out by 'trial and error' or by the use of software programs that are designed to find parameters that give the best fit. Here, the fitting process involved the use of the least squares curve fitting method. A Matlab18 code was used where unknown parameter values were given a lower and upper bound from which the set of parameter values that produced the best fit were obtained. The parameter values obtained from the fitting are shown in Table 4. Figure 8 is a graphical representation of the model fitted to the data for individuals seeking treatment for methamphetamine abuse. As can be seen in Figure 8, the model fits well with the data. For planning and management of interventions, it is important to project the prevalence of the methamphetamine epidemic over a number of years. In our case, we chose 5 years. 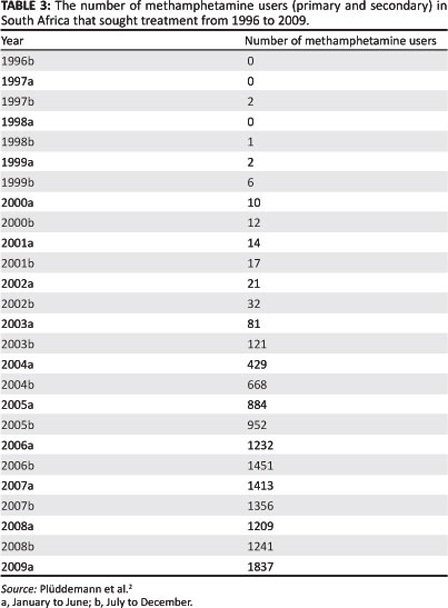 The projected prevalence over 5 years to 2015 is shown in Figure 9. The model projection shows that there will be a gradual decrease in prevalence. For the given parameter values, the prevalence declines from a peak value of approximately 2.3x105 to 1.9x105 over a period of 5 years. This estimation, of course, assumes that the dynamics remain the same over the entire period. We modified the compartmental deterministic model of Nyabadza and Hove-Musekwa15 to incorporate slow and fast progression of initiates and a cycle of light and hard drug use. We also included individuals who permanently stop using drugs and relapse for those under treatment. Relapse was considered synonymous to re-infection in epidemiological models. 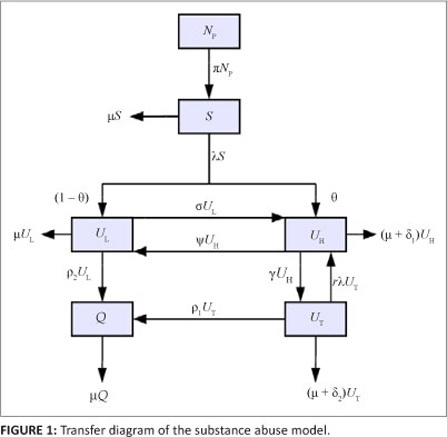 Our model was used to gain some insights into the dynamics of substance abuse. We established the local and global stability of the drug-free equilibrium. We noted that the drug-free equilibrium point is locally stable whenever R0 < 1. 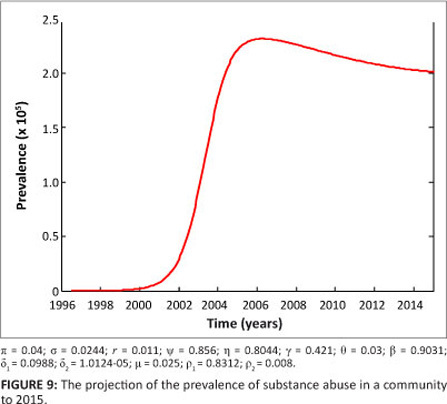 Also, the model has a unique drug-persistent equilibrium whenever R0 > 1, which shows persistence of substance use in the community. For some specific conditions established in Theorem 2, the model exhibits backward bifurcation and some bifurcation diagrams are presented in Figures 3 and 4. The numerical results suggest that the spread of substance abuse can be controlled through a reduction in the relapse rate y, increasing interventions at the light drug users' phase and increasing the uptake rates into treatment. The existence of backward bifurcation in our model is indicative of complex dynamics. It is not sufficient to reduce R0 below unit to control the substance abuse epidemic but rather the value of R0 should be reduced to below R0c. It was shown that backward bifurcation is caused by relapsing to hard drug use when individuals in treatment are lured back into substance abuse by light drug users. The process remains a subject of debate as individuals in treatment are more likely to revert to drug use without due influence. The model thus suggests that strengthening of treatment programmes to prevent relapse is vital. 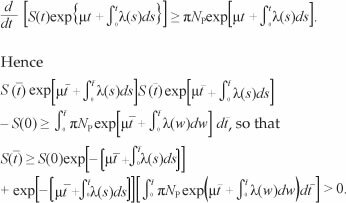 As with many models, the model presented in this article should be treated with circumspection because of the assumptions made and the difficulty in the estimation of the model parameters. As part of future work to improve the model in this article, the model considered here can be refined to incorporate drug users who start using drugs on their own without having contact with other drug users; the impact of behavioural changes induced by campaigns; age structure; and recruitment by drug lords. The model can also be refined for a specific substance of abuse and be fitted to data. Despite its shortcomings, the model provides useful insights into the possible impact of treatment and relapse in communities struggling with substance abuse. A.S.K. appreciates the support of SACEMA in the production of the manuscript. F.N. acknowledges with gratitude the Department of Mathematical Sciences for its support in the production of this manuscript. A.S.K. was the main author of the manuscript, which is part of an MSc thesis. A.S.K. designed the model, performed the analysis and wrote the manuscript. F.N. supervised the research, and helped with the simulations and revisions.